I wasn’t intending to blog about Cadbury Marathon. It wasn’t a goal race or significant event on the running calendar for either of us but then as I’ve had time to reflect, it’s an experience that I’ve taken more away from than expected. 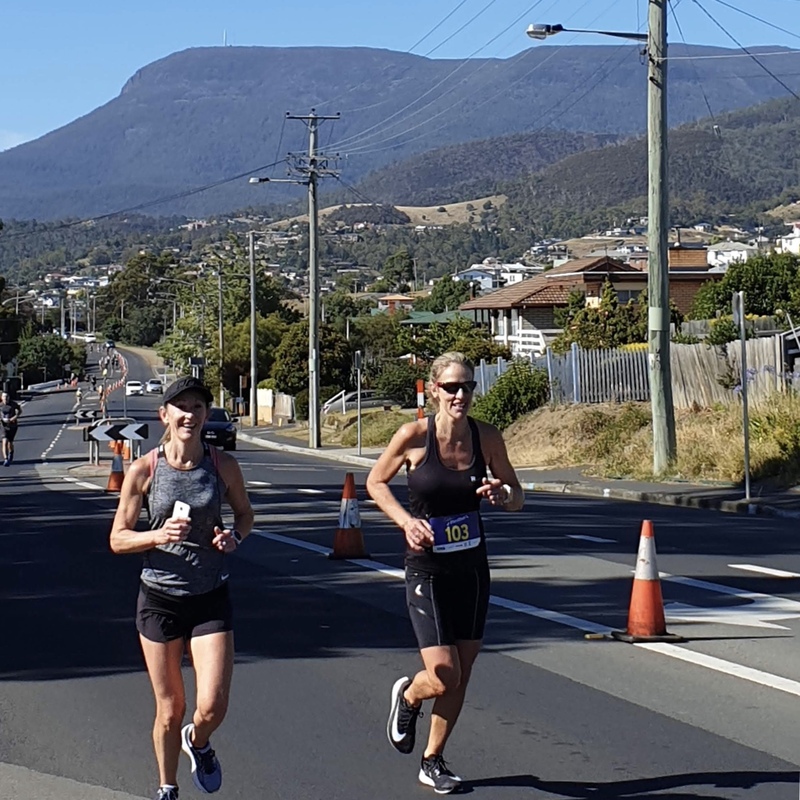 For anyone that hasn’t run the aptly named, Chocolate Run, the course is 2 laps of bitumen road that starts at the iconic Cadbury Chocolate Factory gates in Claremont, Tasmania, winds around the Goodwood shoreline, across The Bowen Bridge and back. It’s pretty much rolling hills in its entirety with about 340mtrs of elevation over the marathon. The half marathon is obviously a single lap of the out and back course and this year the event also offered a 10km, 5km and Mini Marathoners 1km distance. 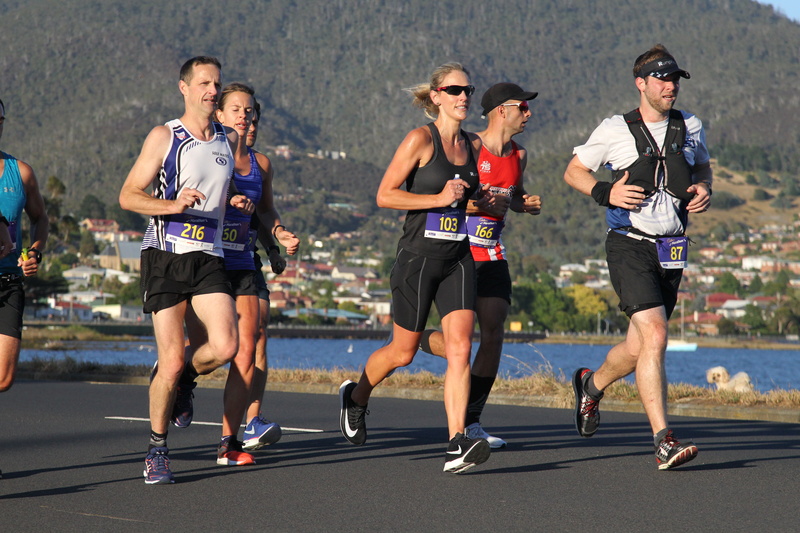 It’s also home to the Tasmanian Marathon and Half Marathon State Championships and still holds its place in my opinion as one of the best race villages and brilliantly curated running events I’ve been to. But let me bring you back a few months to the whole reason I was lining up for my 2nd Chocolate Run and 3rd Marathon in as many months. Straight after running the Sydney Marathon in September I reflected on the way I approached the race leading into the event and then how it actually played out. My run at Sydney followed a similar pattern to my last few marathons, go out hard and bank some decent kms in the first 10km, still feel pretty good at 21km and then hit the realisation at about 24km that I was pretty cactus, only to put in over 10 walking stops throughout the last 17km or so… one thing remained consistent, each time I stopped to walk, I’m 90% sure the body could’ve kept going but my mind was failing me as when ever I started back again I was immediately back on pace. Until my head decided it needed another break and I halted to walk again. With this reflection fresh in my mind the common thing I observed was the way I kept banking faster than average kms in the first 10km only to hit fatigue at 24km. I knew immediately what I needed to do, find another marathon to focus on consistent pace from the start, with no fast kms from the gun. So sitting in front of my computer, I entered Cadbury Marathon 2019. Now anyone that knows me also knows that I never enter a race in time for early bird, some times even missing the entry cut off all together and having to scramble on the day for an entry so this was something out of character for me already. I didn’t want to think about time, but instead I wanted to focus on two things, 1) run a marathon where I held a consistent pace 2) use the benefits of running in a pack. Two things I’m slightly embarrassed to say (after doing many marathons) I’ve never focussed on. So this is the key take out and biggest learning. I set a goal pace, not taking into consideration the races I had entered that would fall into the training window. The goal average pace I landed on was 4:40/km and I got to this as I genuinely thought I could hold that pace for 42.2km. I had done it in 2017 at Sydney Mara. What occurred on the day was quite different, and we’ll get to that in a moment but in short this is an invaluable learning for me and has set me up so brilliantly for the new year. You can’t have your Chocolate and eat it too. Because even at my 10th marathon, I haven’t nailed the execution and more importantly the importance of training. So while I struggle with FOMO, it’s evident to me that you can absolutely run every event on the racing calendar but how well you expect to perform must be realistic. Quick recap of races since September to give some context.. Some 50km and 40km training runs.. So this brings me to 6am on Sunday the 13th of January. Lining up with my pace buddies Gene and Will, all hoping to go out at 4:40/km and stay there as long as possible. The race vibe is always sweet at Cadbury (excuse that pun, honestly not intended 🤣) the directors run a tight ship, and its what I’d call a compact little set up with everything in logical order. We bop around on the start line throwing as much banter around between us and others in close proximity as we wait for the countdown to gun. It’s worthy to note here the weather forecast is bang on and it’s a respectable 11 degrees with no noticeable wind. I hit start on my Suunto as the gun fires and we’re off to get those two first laps of the Cadbury Estate away before heading down the hill and into the race. I’m using TailWind for the race today and because it’s a liquid I was a bit unsure about how to carry it all. Only elites can use the drink stations to leave their nutrition so it was either wear my vest or have Toby support me on course. We went with the latter so I was carrying a small popper of double strength TailWind which I’d swap out every 6.5km. Then I’d use every drink station to take in H2O. 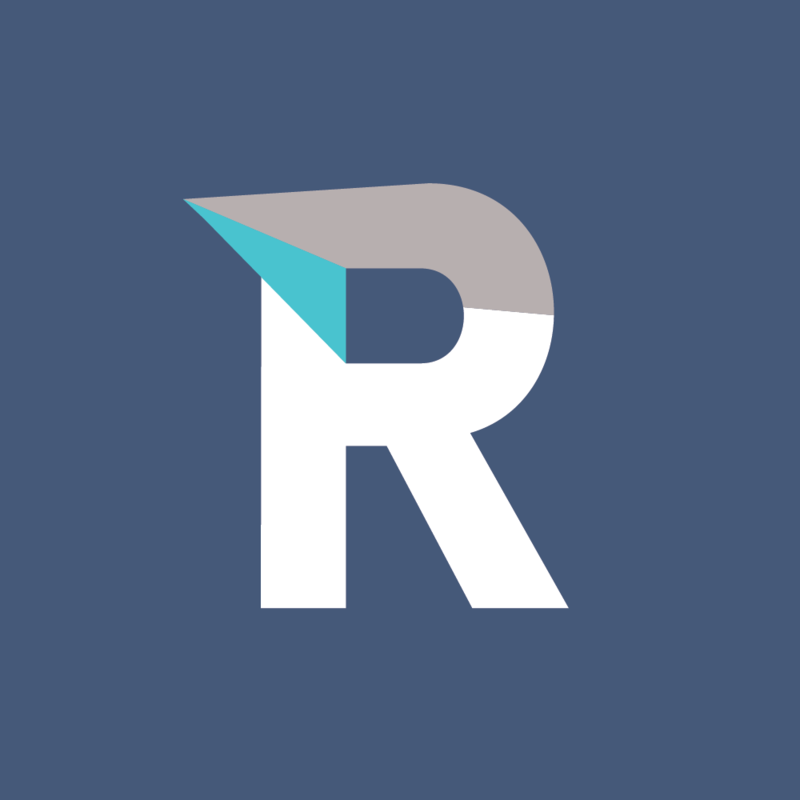 It’s noteworthy that this double strength solution could also have contributed to my performance though I’m so new to TailWind that I can’t comment until I’ve had plenty of time to try and test in training. So the first 20km went to plan and was mildly uneventful. Gene, Will and I quickly fell into a small pack of about four guys and one girl, all running at 4:40/km and we loosely took turns leading, making some minor chit chat but all in all were very focussed. At this point I felt fine at this pace, but reflecting afterwards I didn’t feel like a caged animal, wanting to go faster and having to make a conscious effort to bring myself back. It just felt comfortable, which tells me I wasn’t well rested through taper. Not surprisingly. At about 23km I dropped off the back of the pack at one of the drink stations, stopping for an extra cup of water. I still felt good but did have a small amount of discomfort in the tummy, nothing note worthy, I could just feel the nutrition. I kicked straight back into 4:40/km off the back of that small walk but the group were 20mtrs ahead. I didn’t worry at this point, but did notice I started thinking a bit about fatigue and that I was hoping to get a second wind very soon. With this in mind I kept pace nicely around 4:45/km a little under target, and as I took in some more water about the 24km mark I thought about how many Kms I had to go… not something I ever let my mind get into at this early point in the second half. I was consciously trying to keep pace out of my mind but when I looked at my watch next I dropped to 5s. At the 26km mark I’d thought hard about if this was a patch or if I wasn’t going to get back to 4:40/km sometime soon and I knew the body was not in shape back there so I brought myself out of the slump and into a revised plan of attack for the race. I wanted to finish and had decided it wouldn’t do my body damage or cause injury (this was an important point in the lead up to UTA100 in May) if I kept a lid on pace and brought it home in 5/kms. 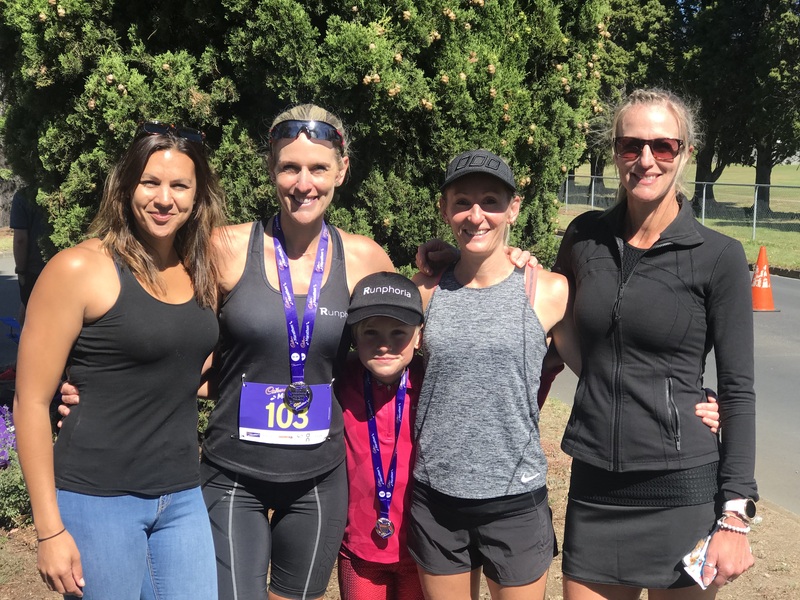 Looking on the bright side, it was a cracking summers day in my home town, my husband was out supporting me, I knew the kids would be waiting at the finish line and Poppy would have just finished her 5km. Bec and all my pals would be there and I could wait to hear about how she and Naomi and the rest had gone in the Half Marathon. Besides how else was I actually going to get home 🤣🤣. At this point I could see a familiar face up ahead, Elaine in her jeans and runners was waiting for me, god I could have cried… just seeing your fave peeps out on course is so incredible. I asked her to run with me for a little and made a joke about asking her how close her car was? Ok I was semi serious… she cottoned on straight away and lied to me that it was some ridiculous distance away. Love that girl. She gave me a hug and sent me on my way. Already feeling a lift from seeing her a kept trundling, putting in a few walking stops here and there which in all honesty had me baffled. I would stop and walk, even before I realised what was doing… and then I’d make myself start again, only to hit pace straight away and wonder why the hell I stopped in the first place.. a girl passed me during one such walk and yelled, “you know it’s all mental!” I genuinely believe her, but still mystified about how to break that link between the brain telling me to stop and actually stopping. Ugh Marathons eh? A world of mystery. The next 12km were a mixed bag of fatigue, defeat, amazement that I was even out here, and pure anticipation to have another marathon finish under my belt and see my family soon. It’s during this time that I also thought, I’m still going to finish around 3:30 which was a decent day out. I told myself I was still doing a bloody good job and to remember this feeling, because they can’t all be perfect. And I feel like The Bruny Island Ultra 64km 6weeks prior was where everything lined up and I truely smashed my own expectations. You can’t have your chocolate and eat it to I thought! So as I rounded out to the familiar sight of Cadbury Estate, another familiar face was in my view. Trent, having finished the Half Marathon had run out to bring some of the Marathoners in. This is such a reflection of the strength in a running community that is paramount in our little town. I was instantly happy to see him after running in no mans land for quite a while and he ran with me, filling me in on his and Hayley’s races and how she’s smashed out such a good time in her debut. Then I looked up and Naomi was in front of me, arms out wide and a big smile on her face. Having just finished her Half Marathon she had run out to meet me and even as I write this now, I’m tearing up.. just the change it makes when you have the support of the running community and your people out there when you need it so badly. I could have hugged her over and over. Trent left to bring in a couple of other marathoners and Naomi knew all the right things to say.. having fun this last year she could tell where I was and instantly took the role of mindless banter with no response from me required. She took me through her race, told how we only had a short few kms to go and it was so good. We picked up the pace a little in these last few kms and even caught up to Will in the last one. We all ran home together and after putting in a little final sprint I was chuffed to make the long road back from half way slump in 3:31:06. With a bag of chocolate in my hand and hugs galore with Bec and the fam bam I am so glad I picked myself up and made it back to the chocolate factory that day. When you have a race that teaches you so much the marathon itself now seems insignificant in comparison to how much I will use it to propel me forward into 2019. 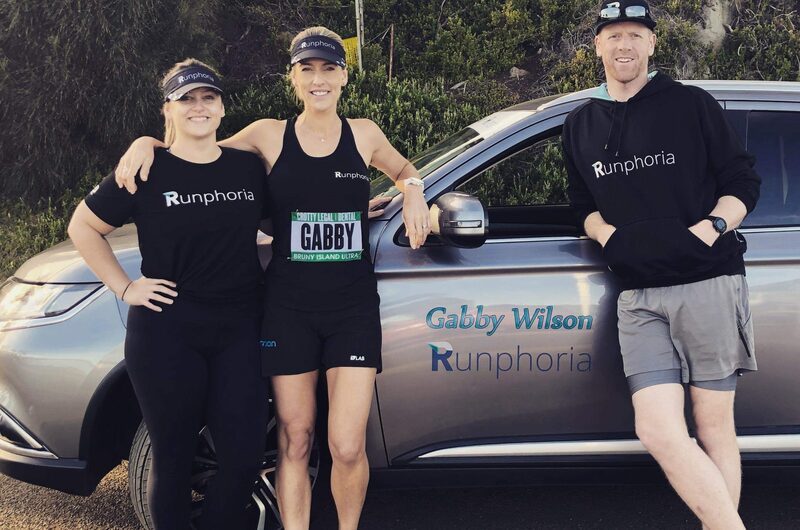 Gabby it is so amazing to read an honest and heartfelt view of running the Cadbury Marathon and the mental games that play out. I’ve never run a marathon or half marathon and have only just jumped up to running 10kms. I have a great sense of relief when I read your comments like: ‘I’m 90% sure the body could’ve kept going but my mind was failing me as when ever I started back again I was immediately back on pace. Until my head decided it needed another break and I halted to walk again’. As a relatively new runner (but on old legs), the mind games that try and trip you up, even in a 5km run, are a real obstacle. I will think about your comments and determination to overcome the mind traps! Thanks.